Although today’s version of fax technology was invented at about the same time as email, the fax machine is a piece of technology that has moved towards being obsolete much quicker. In many cases, people have forgotten or no longer use a fax machine regularly, and therefore need a reminder. Please note that a fax machine (or a printer / multi-function unit with fax) will need an operational land-line phone line for it to work. Users who are trying to use their fax machine with an internet based phone line (such as a VoIP phone line) and not a regular phone line should see our pages on how to fax from a computer and why does my fax machine not work on my VoIP phone line? The best source of information on how to set up your fax machine is found in the user’s manual for the model you own – each model can be different in how it is set up. This page is only a guide or a set up of a “generic” fax machine. If you find your fax machine inoperable or unable to set up, alternatives to sending a fax can be found on our pages on faxing from a computer or an online fax service. A fax machine is used to send a document electronically over the phone network to another fax machine. When you place a document in one fax machine and dial another one, the fax machine you’re sending to will print out a copy (facsimile) of the document. Fax machines do not directly operate over the internet – only on phone networks (many phone networks of today operate through internet based systems, however fax transmissions remain strictly on the “phone” side of those transmissions. As well, services that allow sending and receiving faxes over a web browser, email, or the internet use the internet to connect to the phone network for sending and receiving transmissions.). In order to use your machine, you’ll need to make sure it’s properly set up and configured. Fax machines require a land-line phone line to work. They won’t work with only an internet connection, and they won’t work through an internet based phone line (such as a VoIP phone service). Users who want to fax without a phone line should see our page on how to fax from a computer. Users who want to fax through an internet based phone line (such as a VoIP phone line) should see our pages on how to fax from a computer and why does my fax machine not work on my VoIP phone line? Next, plug the machine into the electrical socket in the wall as well as the phone line. This is an important step – a common mistake is to put the phone line connection into the external line, where the dial tone would not get to the fax machine. If there are two ports for a phone line, then one usually will be for connecting to the wall socket, while the other will be for adding an external phone. Check with the phone connection to make sure you have a dial tone – if you get a dial tone (a humming noise) when you pick up the fax’s phone just like with a regular land-line phone, then you have made a successful connection. If the fax machine you’re using doesn’t have a phone that can be picked up, try connecting a phone through the external phone jack on the fax machine to see if it has a dial tone. It is important to note that fax machines need a phone line to send their signal – you cannot use an Ethernet or broadband internet connection to send or receive faxes. As fax technology works over a phone line, and requires a phone number to dial out, there is no way to dial out through an internet connection. Some people will try to connect their machine through a VoIP provider (a phone provider that streams the phone connection over the internet). In our experience, as well as experience we have received from readers, we have found that this is usually a major cause of problems. See our page on why does my fax machine not work on my VoIP phone line? for more information. For a fax machine to be set up (and then send and receive faxes), it requires two things: Toner (or Ink) and Paper. To load paper in the machine, there are usually two different possibilities – that your machine is a laser or plain paper type printer (it uses paper that you buy like regular printer paper), or that it is a thermal paper machine (the paper for the fax machine comes in rolls). To load paper into a plain paper or laser fax machine, there is usually a slot where paper can be loaded into the unit. It is often towards the back of the machine. On corporate or business level units, there may be a paper tray that can have paper loaded into it. Place the paper into the slot or paper tray that holds the paper. As long as the paper is blank on both sides, it does not matter which way the paper is facing as it is inserted. If the blank side of the paper is important to you (for example you are using recycled paper) there is often no icon or logo to tell which way the paper should be facing – the best way to check is to print a test page and see which side the document is printed. If you get the problem of paper sticking together regularly, sometimes it helps to fan the paper beforehand to loosen some of the static electricity it may have acquired. Toner (or ink) is loaded into the fax machine as well. Thermal (paper roll) fax machines do not use toner and will be able to skip this part. Both ink and toner are often replaced by opening the machine, removing the old cartridge, and inserting the new one in. Thermal and Paper Roll Fax Machines usually have their paper loaded inside of the machine. On most machines, there will be a lever or button that will open the inside of the machine, and the roll of paper is inserted inside of it. Open the unit, and insert the paper roll following the directions (usually these are printed inside of the machine for help). In most models you will need to insert the paper between two pieces of metal and then pull it through to ensure it’s properly set up. Consult your machine’s user manual for more information. Thermal and Paper Roll fax machines are older models and today are not sold as frequently as plain paper fax machines, however are still marketed for certain applications. Each machine has different options and features that may need to be set up. Receive faxes manually (by pressing a button to receive a fax when the line rings) or automatically. Whether or not to have a confirmation page print off. Setting the TSID / CSID header information. You’ll need to consult your user’s manual. However, we have detailed what each of these features and options is. In manual mode, to receive a message, you’ll need to be at the machine when the phone rings and press a button to “answer” the call. If a fax rings through, and you do not answer the fax, then it will go through either to an answering machine or just not pick up. This is an option that people who have a phone line that is shared for both fax and voice use usually select. In automatic mode, when you receive a fax, the machine will pick up after a certain number of rings to the line. While this is the option that most fax machine owners select, for some people who use a shared line they find that a problem is created in that either the fax machine or answering machine picks up first, and that the other is not functional. A confirmation page is a page that prints off when the fax machine has received a fax. Depending on what the primary use of your fax machine is for, you may wish to turn this feature on or off. The main reason people use confirmation pages is that they have a piece of paper that proves that the document has been received by the other fax machine. This is especially important for transmissions such as documents that have a legal importance. In many cases, proof of a confirmation page is enough to confirm that another person or organization has received the message you sent, which in some legal situations can be the difference between winning and losing a case. Other people, who do not need the confirmation page feature turn it off to save on paper. The final option to set on a fax machine (TSID & CSID information) is the header information. This is a line of text that appears on the top of a fax machine – it will usually include a line of who the fax is from, as well as the fax number it has been sent from. A fax machine cannot automatically determine this information from plugging the fax line into it. It needs to be manually entered. In many cases, a fax machine will be moved or sold, and the new operator will plug it in and start using it with the older header information. Always update the header information on a fax machine whenever it is moved or relocated (and delete it when selling one that you own). Dual ring is a technology that was created to allow more that one phone number to a phone line. With dual ring, you can have two different numbers on the same phone line. When the line is busy both numbers are busy, however, it is a way of having a separate fax number and phone number but not have to pay the additional cost for the extra line. When you have dual ring on a phone line, your primary phone number will ring regularly, while your second phone number will have a double ring (or a different ring sound) to it. Dual Ring is considered one of the most troublesome technologies involving phones and faxes. It is important to note one thing with dual ring: In some instances it will not work. Either your phone provider will not send a “second ring” signal that the fax can understand, there will be some type of interference on the line, or your fax machine will simply not want to connect to dual ring. Most fax models will allow you to “record” what your second phone number ring sounds like. Have the second phone number connected by the phone company, and call the fax machine to set up the feature. Most owners manuals will have the instructions to set this feature. It is important that when you set dual ring mode up for a fax machine, that you set the machine to auto receive faxes at a lower number of rings than your answering machine picks up. This is to ensure that your answering machine does not answer before your fax machine. As well, there are some telephones that play a ringtone instead of a ring when they ring – many times, you will not be able to discern whether or not the ring is single or dual with a landline phone with a ringtone. Once everything has been set up, it’s time to test the system to make sure everything is working. 1 – Test to see if the fax is working – Phone the fax number (if it’s on the same phone line as your regular phone use a mobile phone) – does the fax pick up? 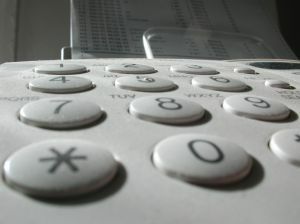 2 – Check dual ring (if you’re using it) – Phone your regular phone number – does the fax not pick up (as it should)? Once you’ve tested the fax line and sent and received faxes – you’re done! Sending a fax with a fax machine is a relatively easy task, as long as it is properly configured. Ensure that the fax is set up properly and turned on. Take the document you want to fax, and put into the document feeder facing in the proper direction (there is usually a small icon that displays which way the front face of the paper should be facing – see “fax face up or face down?” for details). You should not place the document in the same tray that already has the blank paper loaded into it. Press the “Send” button (usually a green button). Wait for the fax to transmit. When the fax is done transmitting, the fax machine will either display “message received” and / or print a confirmation page to show that the transmission was successful. If the message did not go through, it will display and / or print an error message. Take your document with you when you are done. As the process can differ based on what type of fax machine you have, always consult your owner’s manual if you are unsure of the task. If the machine is set to automatically answer the phone line, when the fax rings it will automatically receive the fax and print it off. If the machine is not set to automatically answer the phone line, when the fax rings you will need to either press “start” or “receive” (usually a green button) to receive the fax and print it off. When receiving a fax, do not answer the ring on another phone – this will cause the sending fax machine to think that it hasn’t dialed a fax line, and will usually hang up. Many of today’s fax machines also have print, scan, or copy features. As well, many printers, scanners, and copiers also have a fax feature on them – it’s part of the shift towards multifunction units that has happened in the marketplace. Some fax machines have the capability to forward a copy of a fax to an email address (or just forward a fax directly to an email address without printing it). This feature is most commonly found in business level fax machines, although it has made its way into some consumer level equipment as well. This feature is different than an email fax or online fax. Some fax machines can work through a wireless (wifi) network – very much like a printer or multifunction unit – or connect to a computer (or smartphone) through a Bluetooth connection. It should be noted that a fax machine with WiFi or Bluetooth can only use the connection to connect from a computer to a fax machine – it cannot use a WiFi or Bluetooth connection to connect from the fax machine to the phone network. There are some models of portable fax machines that are built to work on a cellular phone network. While most of this functionality has been replaced by online fax services, it is an option still available. Dual ring mode is technology that allows you to have two different phone numbers on the same phone line. It is a feature that is set up through the phone provider, and can be understood by some fax machines. Memory on a fax machine is used to store received faxes. Most fax machines with memory can keep faxes in memory if they run out of toner or paper – instead of the fax machine rejecting the transmission, it stores it in the fax’s memory for printing at a later date. A common feature in a fax machine is the ability to send the same fax to multiple numbers – either selecting a number of speed dials or dialing each number in separately. This is a time-saving feature. Sending the same fax to multiple numbers still involves waiting for each fax to transmit separately. As each fax transmission is like a phone call, with this feature it is as if the fax machine is separately dialing each number and having a phone conversation with each machine. It does, however, save the time involved in standing and waiting for each transmission. Some fax machines have more numbers that can be stored in speed dial memory than others. Some fax machines come with a corded telephone. It helps reduce the extra space that a separate phone can take up, or lets you check to make sure that the fax machine has a dial tone. The most common paper sizes are Letter and Legal (sizes used in North America) and A4 (often used outside of North America). While some fax machines have different size paper capability, sending a fax with a different paper size than these three is rare. As fax technology evolved over the decades, methods were developed to allow for faster transmission speeds of faxes. For a “newer” transmission speed to work at full speed, both fax machines need to have the same standard. If both fax machines do not have the “fastest” transmission speed, then when they are communicating they will agree on a speed that is at the fastest that they both understand. There are common problems that arise with fax machine use. In most cases, they are simple to fix, in others, they are a problem that makes perfectly common sense, and should be easily to fix, however for one reason or another do not work. In many fax machines, at times a line will appear down the middle of the page, either for faxes received or faxes sent. If you have the occasional line down the page on faxes received, and that line is frequently in different places, then it is likely that some of the people who are sending you a fax have a small piece of dirt or dust on their machine. If the same line appears on faxes that you are sending, however, then look in your instruction manual about how to clean your fax machine. In many cases, it’s a simple task of wiping the imaging area with a soft and gentle cloth, however this can always vary depending on the make and model of your unit. Always look in your owner’s manual before attempting to clean your fax machine, and if you have a service plan with a provider, call them to have their technician clean the machine for you. A common problem for people experiencing no dial tone is to have the fax line plugged into the wrong phone jack on the fax machine. There are usually two lines on a fax machine – one for the external line in, the other for adding an extra phone or line through the fax machine. Check to make sure that the line is plugged into the proper port. A common challenge that fax machine users have is the ability to use a fax machine with a Voice over IP Provider (VoIP). Usually this is a person who has opted to switch to a service like Vonage, Skype, Magic Jack, or a similar provider for their phone line, and has now tried to use their fax on this same line. Our quick answer for how to resolve this problem is that it is best to contact the VoIP provider to attempt to resolve the issue. In many cases, it is simply not possible to get your fax machine to work with your VoIP phone line, and our best suggestion is to get a separate online fax number – we have detailed the technology on our page about online faxing. This is a common problem that frequently comes up integrating “old technology” and “new technology” – the “new technology” has become bigger, better, faster, and stronger, however to achieve that a few things must be sacrificed. If you’ve ever talked (or talked to someone) on a VoIP line, there’s something different about how it sounds – there’s almost a scratchiness, or a robotic sound, or distance to the caller. This is because with most VoIP technology, your voice is being digitized (turned into 1s and 0s) to travel over the internet. Because the amount of bandwidth is limited for the signal (and providers are always looking to save bandwidth), providers sacrifice quality to get the signal through. Since fax machines also transmit a digital signal, this means that unless there is almost perfect quality in the VoIP transmission, the digital signal from the fax machine can become corrupted by the digital signal from the VoIP provider. In some cases, this problem is easy to resolve. However, we usually recommend looking at the features that can come from an online fax service that is separate from the VoIP phone line. In some cases, these services can be bundled together. There are many people who would like to have their fax machine both answer automatically and also have an answering machine on the same line. For the majority of fax machines, this is simply not possible. Both the fax and the voice mail do not know whether the call is a voice or fax call coming through until it is answered, and by then there is no technology around that is able to hand the signal off from one to another. For the majority of users who want to accomplish this, we recommend moving to either a dual ring or an online fax service, as this can resolve most of these problems. What is a fax machine? Definition and usage?